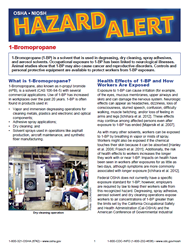 1-Bromopropane (1-BP) is a solvent that is used in degreasing, dry cleaning, spray adhesives, and aerosol solvents. Occupational exposure to 1-BP has been linked to neurological illnesses. Animal studies show that 1-BP may also cause cancer and reproductive disorders. Controls and personal protective equipment are available to protect workers from 1-BP exposure.